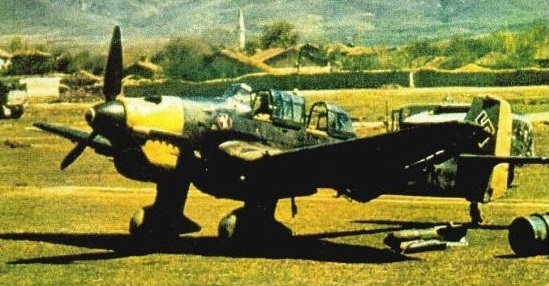 The reputation of the Junkers Ju 87 Stuka (Sturzkampfflugzeug, or dive-bomber) was made during the Polish campaign in close-support operations across Europe. The Luftwaffe believed it to be virtually invincible, but this was true only after air superiority had been gained, as demonstrated during the Battle of Britain when the Stukas were mauled so severely by the RAF that they were later withdrawn from operations over western Europe. Designed by Hans Pohlmann, the fuselage has a metal structure with top hat section stringers and stressed skin covered. The gull wings were two metal spars with a flush riveted stressed skin and fitted with double wing ailerons and flaps. Three prototypes were started in 1934, the first with twin vertical tail surfaces and powered by a Rolls-Royce Kestrel engine. During dive tests in 1935 the tail unit of this aircraft collapsed and the aircraft was destroyed. The second prototype introduced a single fin and rudder and was powered by a 455kW Junkers Jumo 210A, and official evaluation of this aircraft and a further improved third prototype led to a pre-production batch of 10 Ju 87A-0 aircraft with the 477kW Jumo 210Ca engine. The initial Ju 87A-1 production version began to replace Hs 123 biplanes in the spring of 1937. Late in 1937 three Ju 87A-1 dive-bombers of Stukageschwader 163 were despatched to Spain for service under the Legion Condor. These aircraft were powered by the 477-kW (640-hp) Jumo 210Ca and were replaced in October 1938 by five examples of the Ju 87B-1, the first definitive variant of this dive-bomber series with a considerably more powerful engine, improved offensive armament, and reyised structural and aerodynamic features including a recontoured fuselage, larger vertical surfaces, cantilever main landing gear units without the struts that braced the Ju 87A’s main units to the fuselage. 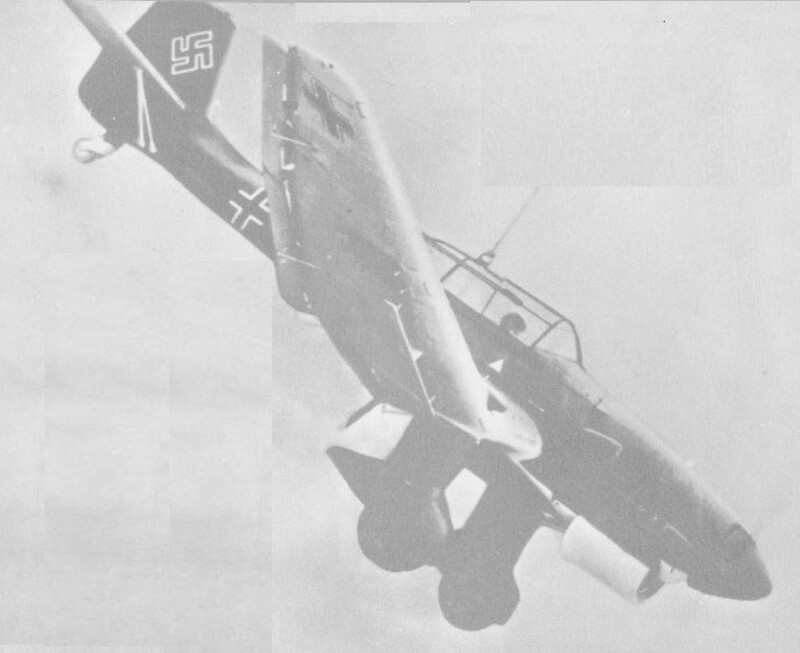 These aircraft operated with Kampfgruppe 88 into early 1939, validating many of the dive-bomber’s tactical principles. 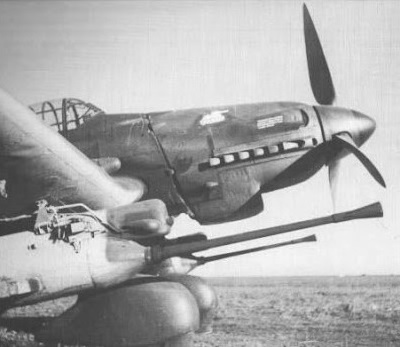 At the beginning of World War II the Luftwaffe had 336 Ju 87B aircraft on strength, and others were supplied to Italy (which named them Picchiatello), Bulgaria, Hungary and Romania. Breda also built a number of Junkers Ju 87Bs under license as the Breda 201 Picchiatelli before suspension of production soon after the Italian surrender. 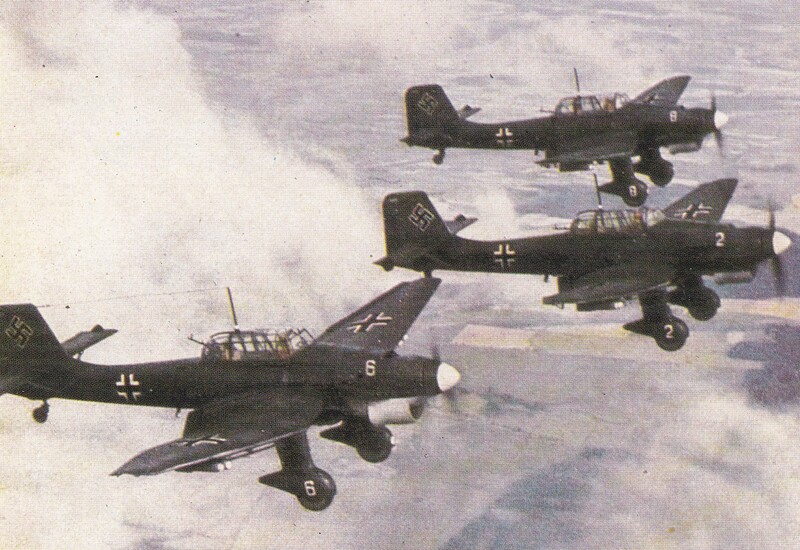 Ju 87s were deployed extensively on the Eastern Front, initially with great success, but by 1943 they were suffering such severe losses by daylight that they were switched to a night assault role. Later in the war a specialist anti-armour version was produced which brought havoc to the tank armies on the Russian Front. When production ended in September 1944 more than 5,700 had been built, the majority after 1940 when their vulnerability without adequate fighter cover had been highlighted in the Battle of Britain. 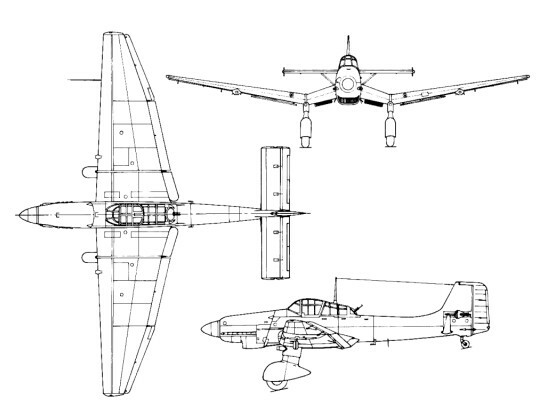 A redesigned and improved Ju 187 was projected in 1943, but following consideration of the design no examples were built. Powered by a 640 hp Rolls Royce Kestrel and fitted with a fixed pitch two blade wooden propeller. Also with the vertical end plate tailplane surface. The aircraft was later destroyed in a crash due to tail flutter. cn 4922 – D-UHUH Powered by 610 hp Junkers Jumo 210A with a Hamilton Standard three blade variable pitch metal propeller. This time with the single vertical tail surfaces. Engine: Junkers Jumo 210Ca, 477-kW (640-hp). Later bombload: 3968 lb, or 2 x pods of six MG 17 or 2 x 2cm MGFF cannon each, or 2 x packs of 92 – 4.4 lb anti-personnel bombs. Length: 35.6 ft. (10.85 m.). Wing span: 45.3 ft. (13.8 m.). Weight empty: 6,085 lb. (2,760 kg.). Armament: Two mg in wings, one in rear cockpit. Max speed: 232 m.p.h. (373 km.p.h.). Range: 370 miles (600 km.). Crew: pilot & 1 gunner. Powerplant: 1 x Junkers Jumo 211Da, 895kW (1,200 hp). Span: 13.8m (45ft 3.3 in). Max TO weight: 4340 kg (9,560 lb). Max speed: 238 mph at 13,410 ft.
Wing span: 45 ft 3.5 in (13.8 m). Length: 36 ft 1 in (11.0 m). Height: 12 ft 9.5 in (3.9 m). Max level speed: 237 mph (380 kph). 87B’s converted for carrier ‘Graf Zeppelin’. Strengthened, fitted with folding wings, arrester gear, jettisonable undercarriage, inflatable flotation bags under each wing and some carried a two seat rubber dingy. Armed with two wing mounted MG 17 machine guns and an aft firung MG 15 machine gun. Engine coolant radiator now under wing. Redesigned engine cowling, cockpit canopy, undercarriage fairings and improved armour protection. Some fitted with twin 37mm (flak) cannon, revised canopy, simplified landing gear and larger vertical tail. Armament: 6 x MG 81 in under-wing WB81 weapon containers. 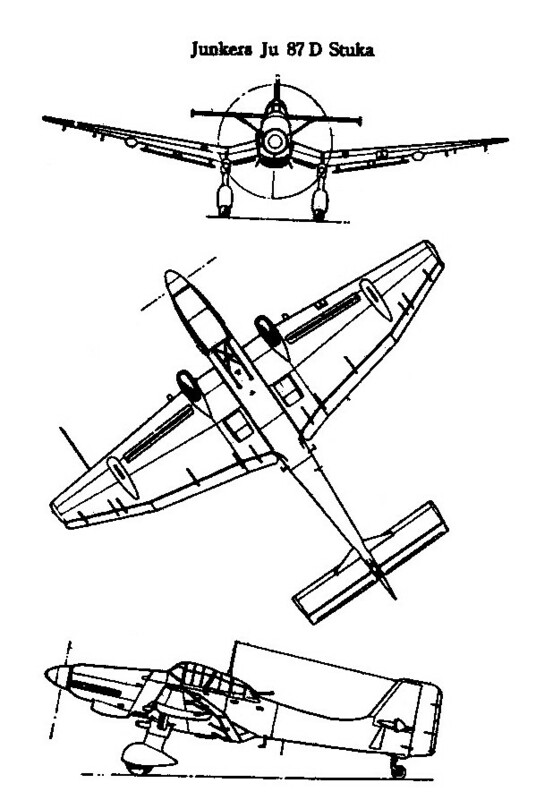 Proposed two seat, catapult launched dive bomber. Able to carry bombs or torpedo. Not built.